AA: My name is Anthonia Oluwatomi Akitunde. 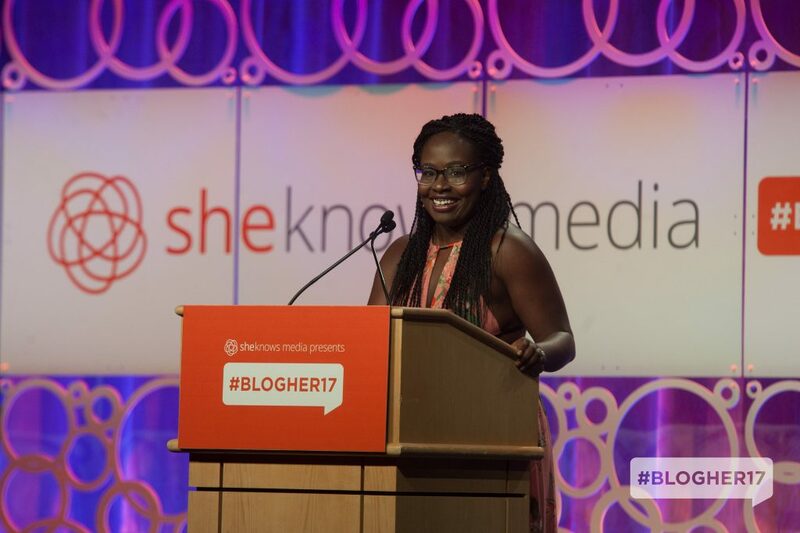 I’m a storyteller and journalist from Kansas City, Missouri living in Queens, New York; Tony and Emilia Akitunde’s daughter; Ladi and Tunde’s older sister; and Scott Fried’s wife. I have an incredible group of friends who are my chosen family all over. There’s much more to me, but I think that’s a good place to start! AM: Please share a bit about your background and upbringing. AA: My parents are Nigerian, so a lot of the stories you hear about being the child of immigrants and Nigerians apply to me. The importance of a good education and hard work were drilled into each of us at a very young age, as we grew up, and even now that I’ve long flown the nest. Thanks to my mom, I was a huge reader and in turn became an even bigger writer—I’ve always believed in words’ power to transform. Though it didn’t happen the way I thought it would at the time—maybe if I just read this book or article, I’ll figure out how to be a less awkward teenager!—I now see that I’ve been able to become the person I’ve always wanted to be through my writing and work. AM: I know you’re a newlywed, please tell us a bit about how you and your husband met. I was taking it way too seriously, and throwing myself into these “relationships” with men I never would’ve been interested in if I didn’t feel like I needed to be in a relationship. I took a break, came back with a more lighthearted, “whatever happens, happens” attitude and got my first message from him a few days after I reactivated my account. He was funny and interesting in our first messages to each other, cute and nice during our first date, and just very much what I should’ve been looking for in a boyfriend and now partner. AM: Describe your wedding to us. AA: Oh man! I’m trying to get better about the way I frame the wedding, because there’s so much pressure for it to be this Pinterest/Instagram-perfect day—and as a recovering perfectionist, it’s easier for me to point out the things that went wrong than what went right. So I’ll say, it wasn’t perfect, but it was fun, beautiful, and the best representation of who Scott and I are as a couple and who our families are. It was very intimate, with about 80 of our closest friends and family laughing, crying, dancing, communing, and celebrating in a gorgeous historic building in downtown Kansas City. We made sure that both of our family’s backgrounds were present, while also making sure the things that make us us were front and center, too. The day before the wedding, we had a traditional Nigerian introduction ceremony, which celebrated our two families becoming one, in my parents’ backyard with our closest friends and family. 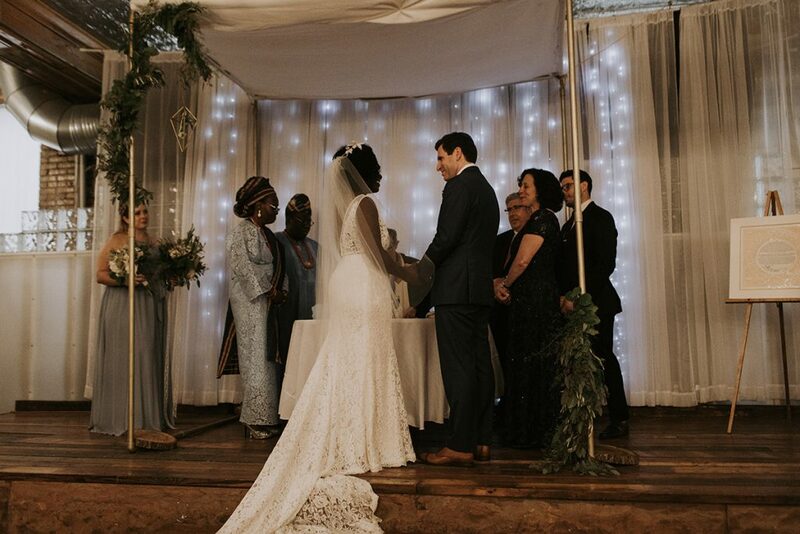 We had a Reform rabbi perform our wedding ceremony because Scott’s faith is very important to him, and the Reform ceremony traditions felt most true to my beliefs as a feminist. We wrote our own vows, Scott and I made our chuppah (the canopy couples stand under during the ceremony that represents their home), and the whole process and wedding day just really cemented why we make sense together. 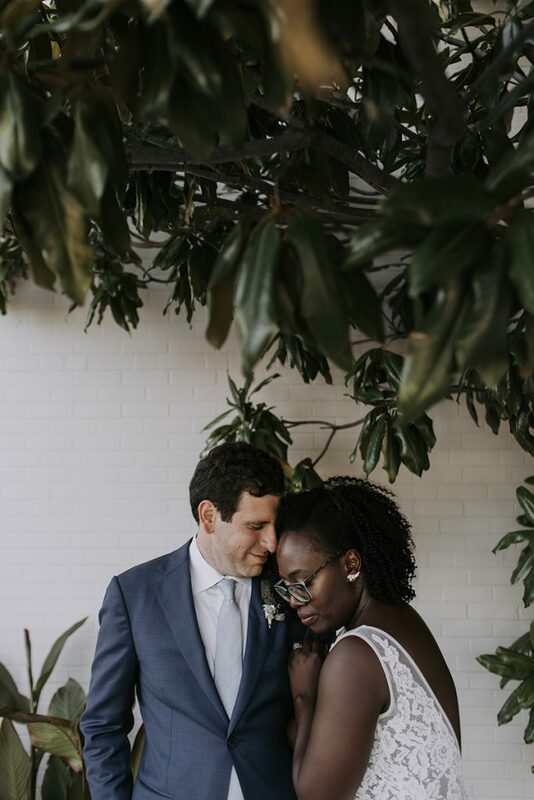 I knew before Scott proposed that I wanted to get married back home in Kansas City and have my favorite barbecue restaurant, Joe’s KC, cater the reception. I was really excited that we were able to show KC off to all of our New York friends and family. My parents found a Nigerian caterer (no easy task in Kansas City), so there was just amazing food everywhere you looked. And since we’re kind of a silly couple, I had a petting zoo for the cocktail hour because Scott and I love petting zoos, and a slow motion booth for the reception to create a fun video as the night went on. AM: Please share what you believe to be true about motherhood? AA: That motherhood has the power to change who you are on so many levels, from the cellular to the way you view the world. AM: What life lessons or motivations did you learn from your own mother? AA: My mother is the hardest working person I have ever met in my entire life. She works day in, day out at a job that may not afford her the luxury of pursuing her passions but affords her the privilege to provide for her family and friends. And now that I’m older, I realize that her hard work has afforded me the privilege to do what I do. There are so many lessons she’s given me over the years, but the one that I’ve been coming to more regularly recently is being careful about what you speak into the universe. It’s basically affirmations: She’s all about speaking the good things you want into existence rather than the things you’re scared of or fear. AM: Please describe mater mea and your role at the company? 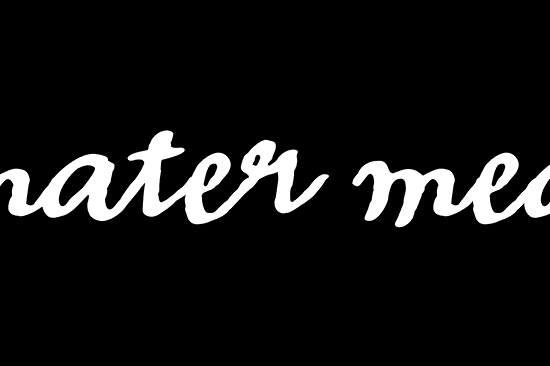 What does mater mea mean? AA: mater mea loosely means my mother in Latin. I’m the founder and editor-in-chief of the company; it’s a platform that celebrates Black women at the intersection of career and family. 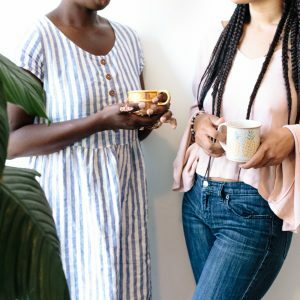 It’s a safe space to go to hear Black women tell their stories about work, parenting, and relationships, and share your own stories as well. I try to show as much as possible the different ways Black women mother, while giving a more realistic depiction of what it means to be a Black woman, mother, partner, employee, entrepreneur, and all the many other hats we wear. AM: What is your favorite part about the mater mea platform and why? AA: Over the course of the five years mater mea has been around, it means so much to me that women feel safe sharing their stories with me and in the space I’ve created. I first realized just how important the space was when I interviewed educator Takiema Bunche-Smith. Her motherhood journey included losing her first child 37 weeks into her pregnancy. We were sitting across from each other at a coffee shop, crying, and it felt like we were the only two people in the world. 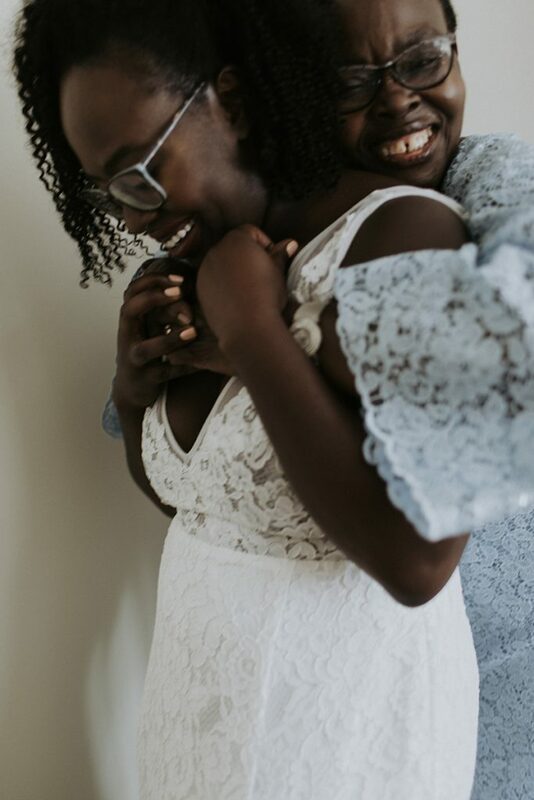 But in sharing that loss and the joy she’s experienced after being able to deliver her second child, she gave strength to other women who have experienced stillbirths and other forms of losing an infant. I still get emails about how her story or Rhonda Ross’ 10-year struggle to conceive helped a woman struggling with the same issue. AM: Do you envision yourself becoming a mother someday? If so, what imagery comes to mind? AA: I love this question about the imagery that comes to mind, because there’s always a picture we have in our heads about everything—partners, friends, work, life, children—and I think the most interesting parts of life happen when the reality ends up not looking anything like the picture we have in mind. But to answer the question, I would love to be a mom! I just hit that age/life period where pretty much all I do is think about having a baby. If I see a kid, I’m like “Ahhhhh, I want one! I want one nooooow!” I want three kids: two boys and one girl, though I think that’s just me wanting to replicate my own family. When I picture being a mom, it’s always to a 2- or 3-year-old. I rarely think about the actual infant/baby stage, which I think is my brain wanting to get to the fun stuff instead of thinking about some of the harder parts! More recently, I’ve been thinking about wanting to visit Nigeria with my eventual firstborn and Scott. It’s become a recurring dream; I think it’s my maternal grandma, who passed away almost two years ago, calling me home. AM: What fears or hesitations do you have about motherhood? AA: Anyone who knows me will tell you I’m just a natural worrier. So I have a lot of worries and hesitations about motherhood. I worry about not making enough money to support a family, since my husband and I are both freelancers. I worry about being able to carry full-term, since it was a concern my obgyn mentioned because I had surgery to remove some sizable fibroids years ago. 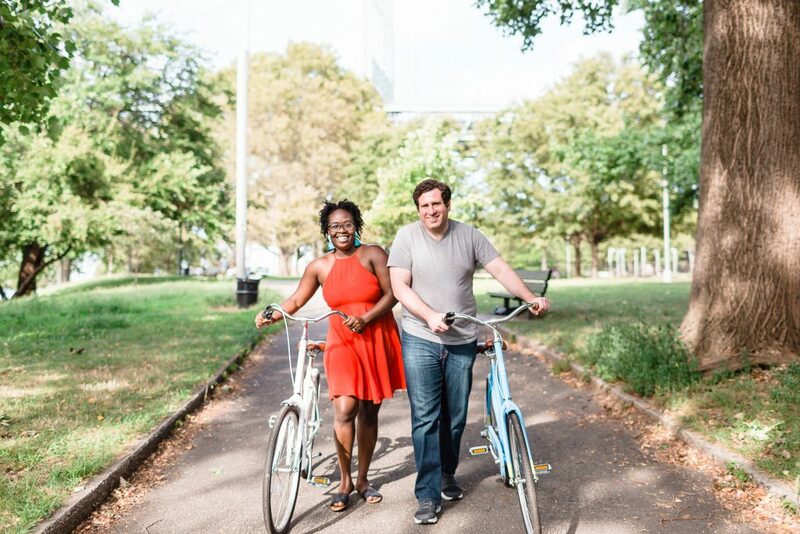 I worry about what it will mean to raise Black Jewish kids, since we’ve already experienced racism as an interracial couple from a Reform rabbi. But, I’m lucky because I’ve cultivated a really great community to help me process and deal with those fears and concerns should they arise. AM: What excites you about motherhood? AA: I think seeing my husband as a father is something I’m really excited to witness. He is so family oriented, and has always wanted to have his own family. He’s already such a supportive partner, and I know he’s going to be an amazing dad. The idea of him just dadding around the apartment makes me melt. I also think creating and learning a whole, brand new person you made is one of the most exciting/craziest things about pregnancy and motherhood. It’s such a mind trip! AM: What do you do for fun? AA: I’m trying to keep up with this peak TV age we’re living in, but I’d much rather read a book or think piece, or watch cartoons on Hulu or ‘90s R&B music videos on YouTube. I love entertaining: Cooking is one of my love languages, and I love having my friends come to my apartment to talk over a big pot of short ribs or Nigerian food. AM: What books are you currently reading or would like to recommend? AA: I just finished Claudine Rankine’s “Citizen” and am finishing up Eve Ewing’s “Electric Arches.” I wouldn’t describe myself as someone who liked reading poetry, but I now realize it was because I was reading work that didn’t speak to me or my experiences. Both of these works do just that in a way that left me feeling so seen—there were so many times I had to put the book down after reading an especially “yaaaaas” worthy line to just take it all in. And I love, love, love “Homegoing” by Yaa Gyasi. That book has stayed with me for such a long time; it’s just masterful. AA: You can visit mater mea online (www.matermea.com), and follow mater mea on social media at Facebook (www.facebook.com/matermea) and Instagram (www.instagram.com/matermea). Ugh!! Anthonia’s interview has me wanting more. I want to invite her over to my house, brew us both a cup of tea, curl up on the couch, and ask her so many more questions. Like, “How did Scott propose?”, “What’s your favorite Nigerian dish to make?”, “What can we expect to see from mater mea in the next few years?”. Maybe I’ll be able to convince Anthonia to come back and do a Part 2 once she’s expecting! If you have yet to visit the mater mea platform I really encourage you to do so. The mater mea Instagram account is so full of inspiring women sharing what motherhood and career look like for them. There’s such an array of motherhood experiences that you’re bound to find a few women who you can relate to. I also did a breastfeeding series over on the mater mea site which you can dive into to learn all about What the First Two Weeks of Breastfeeding Actually Look Like, Choosing a Lactation Professional that’s Right for You, & Pumping at Work. I also did a LIVE Breastfeeding Question and Answer video which you can still watch. 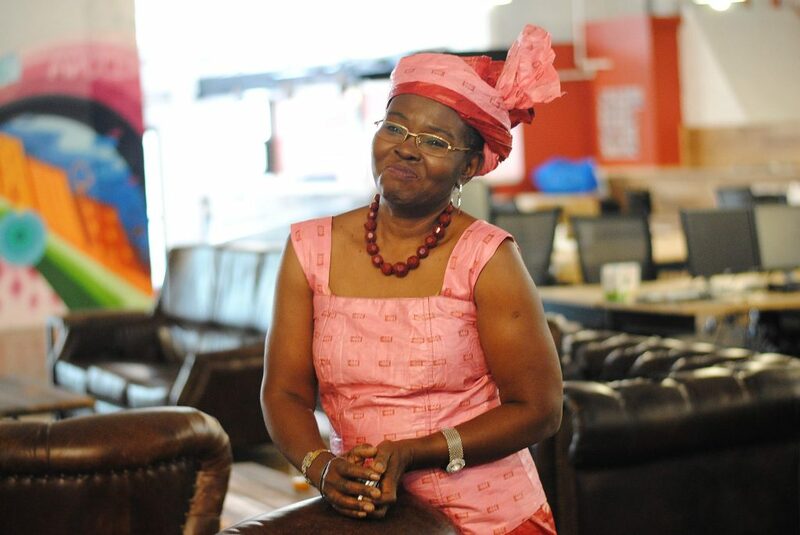 I so love learning about the lives of women from around the globe. To hear how one’s upbringing may encourage a certain thing or praise a certain idea, and then see how that person manifests those ideals in their own unique way is quite powerful. Seeing the breadth of diversity among women and how they’re living unabashedly inspires me to stay true to my convictions and encourage others to do the same. If you enjoyed Anthonia’s interview please let me know in the comments section. If you have questions for Anthonia, please leave them and I’ll pass them on to her.